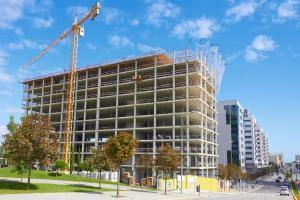 Estimating job costs is becoming increasingly difficult for construction contracts. Competitive bidding practices, rising labor and material costs, delays in obtaining permits, trade agreement restrictions with other countries, changes in government regulations, and the shortage of qualified workers are all contributing factors. Even if you are diligent about estimating the cost to build a project, by the time construction starts you could be in a situation where the expected profit on the job is less than you expected. Commonly referred to as profit fade, if it is a long-term contract you may benefit from the look-back rule. The IRS could have to pay you interest for paying more than you had to in taxes. On the other hand, if your job costs estimate where higher than your actual construction costs you could owe the IRS money. The Tax Reform Act (TRA) of 1986 made it mandatory for contractors to use of the percentage of completion method (PCM) for most long-term construction contracts. With this legislation came the look-back rule to ensure that contractors pay the correct amount of taxes on income generated from a long-term contract in each year the project is under construction. The IRS defines a long-term contract as one that is not completed in a tax year. PCM requires income be reported in proportion to the percentage of costs incurred to date when compared to total anticipated costs for the contract. Estimated taxes are therefore paid in the taxable years prior to the completion of the contract, not the actual tax due. You must file Form 8697 – Interest Computation Under the Look-Back Method for Completed Long-Term Contracts with your tax return when a long-term construction contract worth more than $1,000,000 is completed. The look back rule applies to income reported for regular income tax purpose, as well as the Alternative Minimum Tax (AMT). You can elect not to apply the look-back if reported income is within 10% of the cumulative taxable income or loss on the actual contract price and costs. This test must be met in each year of the contract. 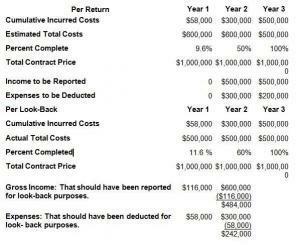 The look-back calculation compares the percentage of gross profit that was recognized in prior years to the actual gross profit percentage once the job has been completed. The calculation determines if the gross profit on a job was over or underreported in prior years based on job cost estimates at the time you filed your income tax return. The look-back calculation does not result in a tax liability adjustment, so you cannot amend your tax return. It only determines if interest is due to the IRS or should be refunded to you depending on the results. Using the actual contract price and contract costs for each filing year, you must reallocate total contract income among prior years using actual contract price and costs to all contracts that are completed or adjusted (e.g., post-completion revenue and expenses) in the filing year. If you expect to incur additional allocable contract costs in a tax year subsequent to the year in which the contract is completed, you may be able to include these additional costs in the look-back calculation. You may elect to defer the recognition of gross income and the deduction of costs incurred on contracts until the year in which 10% of the estimated allocable contract costs were incurred. Once the contract is completed and you calculate the look-back interest, you may find that the 10% year was earlier or later than the year originally reported. If so, contract costs must be reallocated to the new 10% year. The following is an example of using the 10% method and the application of the look-back rule. If you are a small contractor or home builder, you may be exempt from the look-back rule. To qualify for the small construction contract exception, the contract must be completed within two years from the contract start date and your average annual gross receipts for the three years preceding the year in which the contract is entered cannot exceed $10 million. To qualify for the home construction contract exemption, 80 percent or more of the estimated total contract costs must be attributable to residential construction and related land improvements. The contract must involve buildings containing four or fewer dwelling units and can include improvements to real property directly related to dwelling units. The look-back rule is complicated. The tax professionals at LaPorte CPAs & Business Advisors have the experience and knowledge to help guide you through the compliance process. Contact us at any time with questions. We are always happy to help.